Page number: 1 2 3 - Can this be done? Is there any blocs with this built in? or is it just a case of creating another page for this. You can create page templates in Blocs. Once you have page one done you can choose from the top menu page, then add to template library. 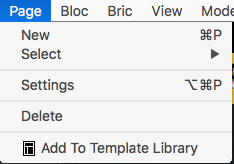 You can also create a new blank page and then go back to page one and choose duplicate Bloc then choose the destination as the new page. Sometimes I find this just as easy. So basically duplicate the page and create it as page 2 and the next one as page 3 and create links at the bottom of each page to represent that page. Yes, you can also just click create new page and you will get the chose of creating a duplicate page also. Choose page one and then name the new page, page two. @Norm you have this type of style on your store page. Did you do this by creating another page for it, or is there a simple way of doing it like some blog pages where you can set it to show 6…or 8 icons at a time before opening up another page. There is - just three links to other pages. Easy to do by hand. It’s only an issue when you have loads of pages, but if you do have loads of pages, you have a load of work to do besides this. It’s so simple to do I’m not sure why it’s a problem.